This book is essentially a transcript of a discussion between professional authors J.A. (Joe) Konrath and Barry Eisler. Konrath has been self-publishing for several years and has made a very good living at it. I think he would probably argue that he makes more self-publishing digital books than he would be earning through legacy publishers. Eisler is known for turning down a $500,000 advance because he believed he could earn more money by self-publishing the same book. The value of the book is in the advice and information it shares. There is some entertainment value as well, in that the authors both have some amusing and funny things to day. My biggest complaint with the book is that it felt like Eisler and Konrath complimented each other every few pages through the book. They make it clear that legacy publishing is facing a number of challenges, most of its own making. They are trying to prop up the sales of printed books by keeping eBook prices artificially high, and refusing to release the eBook until the paper book is ready to ship. They've been reducing author royalties, taking longer to pay the authors, and pushing more of their costs on to agents (e.g., editing and cover art). Titles don't stay on store shelves long, and not all books get equal treatment at the retail level. By comparison, authors who self-publish through Amazon.com fare much better. They collect 70% royalties on each sale (instead of royalties in the 15% range from legacy publishers), and receive payment each quarter (versus semi-annually or longer for legacy publishers). They have control over the content of their books, choose their own cover art, etc. Another advantage of eBooks is that they remain on the virtual store shelves "forever". Brick and mortar bookstores can usually only stock what is selling well right now, and few can afford to keep many older titles on their shelves. With eBooks and retailers like Amazon, all of an author's works can remain for sale on the "shelf" indefinitely. When a reader discovers one of an author's books, there is a good chance they will purchase others from the author's backlist of titles. An argument often made for legacy publishing is that book publishers serve as "gatekeepers" for readers, separating the good books from the bad and ensuring the quality of the books they publish. The argument says that self-publishing will lead to a flood of crappy, poorly written books, and that all authors will suffer. Readers, Konrath and Eisler argue, are good gatekeepers. They can separate the wheat from the chaff, and help others do the same through reviews, lists, recommendations, and word of mouth. This is the same way people help each other find the "good" videos on YouTube. Konrath argues that legacy publishers haven't been very good at separating successful from unsuccessful books. One of his titles that the major publishers in New York rejected 12 years earlier went on to become a #15 bestseller on Amazon and earn him $17,500 in just 12 days. And because it's still on the virtual shelves there, it's continuing to earn him money today. The authors make it clear that although they are confident that digital books will outsell paper books (if they aren't doing so already), they do not believe that paper books will ever go away. Apple iPods and MP3s didn't eliminate the CD. The CD didn't eliminate cassettes. Cassettes didn't eliminate vinyl. You can still find music being produced today in all those formats (except maybe cassette? ), just as you'll have no problem finding paper books 10 or 20 years from now. Konrath and Eisler say that self-publishing of eBooks isn't about bringing an end to the paper book. It's about authors taking advantage of a new technology and distribution system that enables them to make higher royalties and reach readers without going through publishers. It's worked out well for them. Konrath reported making $102,000 in the month of March 2013 alone – most from older legacy-published titles no longer in print. 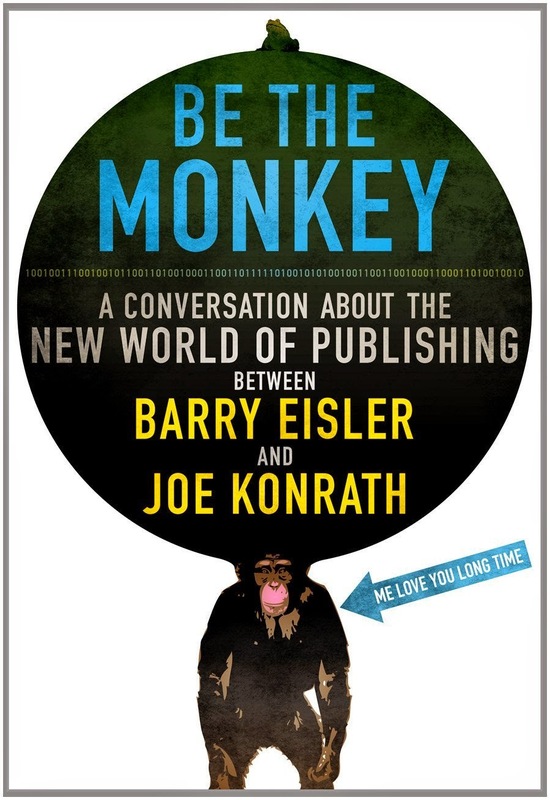 Be The Monkey is an entertaining read overall, though it is a bit annoying how often Konrath and Eisler compliment one another. For 99 cents, though, it's hard to find much fault with it.